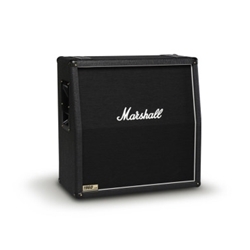 The 1960A is the world’s best selling 4 x 12” speaker cabinet, with a heritage that stretches back to the early 1960s. This authentic 4 x 12” cabinet design, which has changed little since 1962, is the touchstone for all other angled 4 x 12” cabs. The 300 Watt 1960A has excellent sound projection, which is achieved by angling the baffle so that the top two speakers face upwards slightly, allowing higher frequencies to really cut through. The angle also makes for a better onstage sound, as the sound focus is up towards you, rather than straight out. Speaker Size	4 x 12"